I just updated the WWN Converter to version 3.4.0. The changes based on the some feedback from the field. Thanks for that. If the included auto-update function fails, re-install the product from the ZIP file or via ClickOnce. You can download the current version via ClickOnce or in a ZIP file. Please keep in mind, that this piece of software is shippted without any warranty. I spend some time on the Data Protector NDMP Integration, especially to compare it to CIFS/NFS backups available with the regular Disk Agent. Luckily an older EMC Celerra NS20 was available and I was able start immediately. A quick look at the NDMP support matrix revealed no restrictions since the unit was running T5.6.50.203. To give you any idea on how the NS20 was configured, I just put together a quick drawing and some tables. This NS20 comes with one DAE4P used for FC and one used for SATAII drives. Redundant X-Blades (Data Movers) are configured as Active/Standby at the bottom provides NAS capability of the unit. Each X-Blade is equipped with two so called AUX ports used for tape connectivity. In my setup the first AUX port of each X-Blade was attached to the SAN infrastructure and zoned to an existing tape library mainly used for Object copies at the moment. Due to an upgrade from vSphere 4.0 to 5.0 some of our virtual machines stopped working in VEPA/vStorage backup sessions. I’ve noticed that a quiesced snapshot using vCenter was not possible. I was able to fix the most of them by reinstalling VMware Tools to fix some VSS inconsistencies, but an Exchange 2010 VM caused some additional issues. vCenter reported the following warnings during creation of a quiesced snapshot. 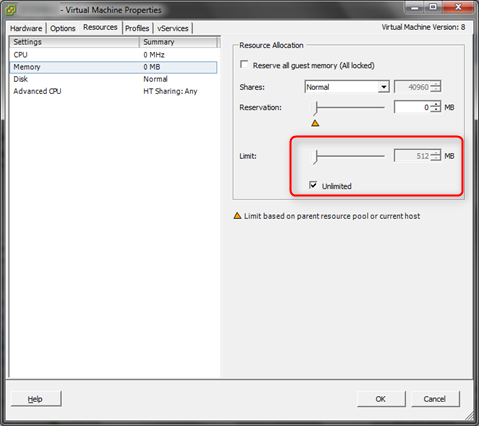 Create virtual machine snapshot / An error occurred while quiescing the virtual machine. See the virtual machine's event log for details. Check the output of vssadmin list writers to determine the status of available VSS writers. In our case the Exchange writer reports an error. The event logs of the Windows 2008 R2 VM had the following errors, pointing to a VSS Provider related issue. Strange but true, the Exchange 2010 VSS Backups using Data Protector work as expected without any problems. 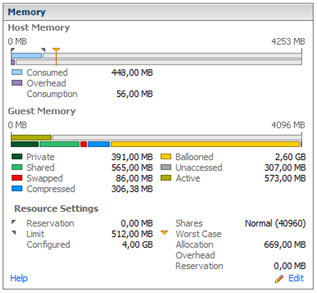 Just came across a strange effect, at least strange for a system administrator, related to VMware Ressource Allocation. When checking one of my virtual servers I’ve noticed a high memory usage compared to the running processes in Task Manager and Process Explorer. The barely no free RAM left. I was not able find a relation between running processes and consumed memory. It turned out that someone around messed up the Memory Ressource Allocation for this specific VM and nearly downed it completely. I was not even able to perform a proper backup and the application was no longer responding in a proper fashion. After changing the Memory Limit from 512MB to Unlimited the system returned to normal memory usage after some time. The impatient would choose to reboot because Windows will need some time to reclaim the memory once the ballooned area is removed. Ressource Pools and Ressource Allocation are really useful. Both features helped me survive times of memory shortage in the past. Use them appropriate to prevent unnecessary swapping. Have you ever wondered what happened to management agents the major server vendors provided in the past for VMware ESX? (e.g. HP Management Agents for VMware ESX) They have been moved into a more standardized framework within ESXi – the so called extensions. 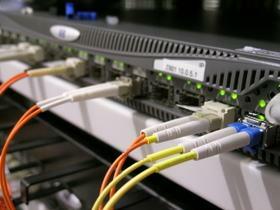 Those extensions are bundled with the regular ESXi installation media by most server vendors. If such a media kit was used for ESXi installation, some additional software is most likely installed. You can verify this is Tech Support Mode (TSM) with the command esxupdate query. If an ESX farm grows, it can become quite an issue to keep track of the extensions installed when going forward upgrading to the latest VMware update pack. As there are sometimes hard dependencies you might want to postpone the upgrade until a certified extension package is ready. You can apply extension updates using esxupdate or vihostupdate.pl for each host, but a much more comfortable way is the usage of VMware Update Manager (VUM). If you ever worked with Hyper-V on Windows 2008 R2 you might know the Linux support is still an issue compared to other hypervisors like VMware. 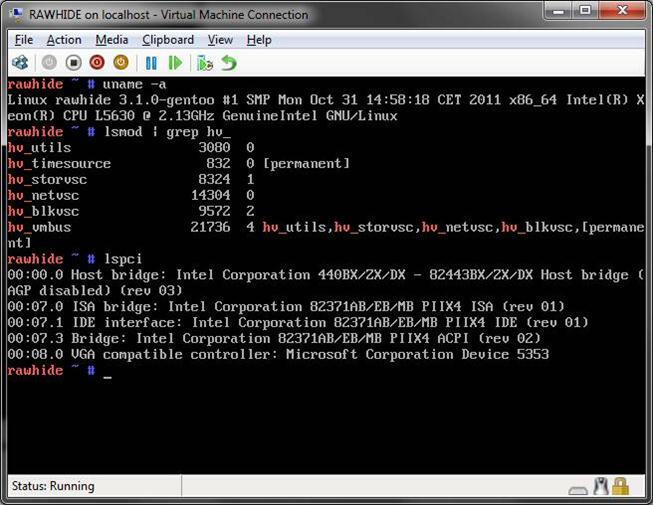 In the meantime Microsoft official supports SLES and RHEL as Hyper-V R2 guests. To have them running smoothly, you should install the Linux Integration Services Version 3.1 for Hyper-V on each Linux VM. I spend some time to get Integration Services running on Gentoo Linux. The nice thing is, that with the release of Linux Kernel 3.0 and later the source of the Integration Services have been integrated into the kernels staging directory /usr/src/linux/drivers/staging/hv which is useful if you want to avoid external code. 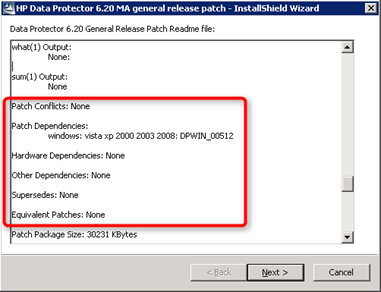 As you hopefully know, there is a specific patch order for Data Protector patches you should follow – especially on Windows CS, because the patches are not only applied to the Installation Server. So, if you forgot to rename the patches while downloading them from http://support.openview.hp.com/selfsolve/patches you might want to identify the patches before installing them. 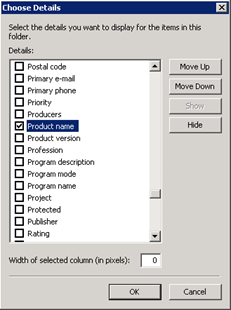 The easy way is to enable the Product name field for your Windows Explorer. This works for Windows patches only – Solaris, Linux and HP-UX patches are a bit different. First switch your folder view to Details and then right-click on any visible field in to bring up the context menu which allows you to add additional fields of your Windows Explorer. The more time consuming way is to open each patch one by one, look at the title bar and check the patch dependencies for each patch available and currently installed. This is also the preferred way if you can’t remember the patch order at all. 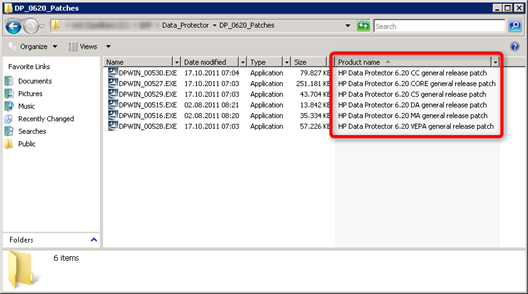 As you might have seen on Mr_T’s Blog on hp.com, there is a workaround available for the restrictions in the Data Protector scheduler. 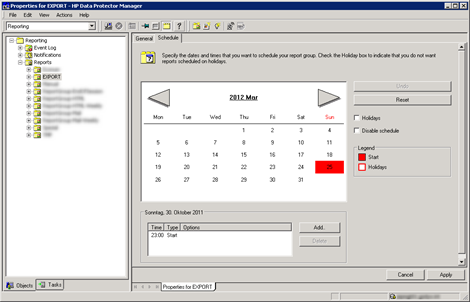 It allows you to schedule some specific points in time such as the last Friday per month which is not possible using the GUI at the moment. It you need to know how this is implemented for backups, visit his blog. If you need to schedule a copy session or report group, read on. There is a slightly difference in the syntax, but it’s quite easy to schedule the last Sunday for example. 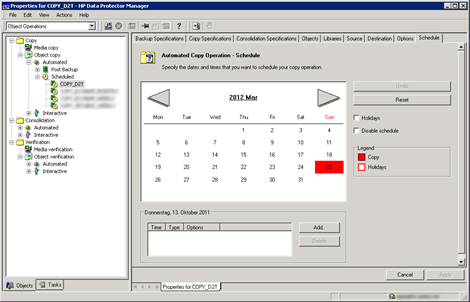 Just open the schedule file related to the copylist located in Omni_Home\Config\Server\copylists\scheduled\schedules. To have the last Sunday scheduled as mentioned above, put the following lines into that file and refresh the GUI. The procedure for a report group works similar, but with a slightly different syntax. The file for your report group in Omni_Home\Config\Server\rptschedules needs to be modified like this. Hint: You can also use -at –:– for the -exclude to be more generic. Device persistence on Linux is not as hard as it seems. Current releases of all major distributions (RHEL and SLES) come with preconfigured udev rules. They will create aliases in the device filesystem in /dev/tape which is pretty handy. The name of the alias will vary, depending of the device but will remain consistent across reboots on different hosts. The original /dev/st* and /dev/nst* files will not be changed at all. Sure, you can add additional rules, but this won’t make things better. It is a good practice to avoid the device serial number in the name as the S/N will change if the drive is replaced. A device WWID will remain if the library overwrites it. And also keep in mind, if Linux uses an initrd image, you’ll have a hard time making the st, nst and sg devices persistent across reboots. Even if this information is distributed in Native Linux Device-Mapper Disk Arrays reference guide trough SPOCK, I’d like to wrap up the most impotent facts for the impatient. By now, this is configuration is fully supported by HP. Emulex as well as QLogic FC HBAs are supported. I’d like to refer to SPOCK for a complete listing. Based on distro, kernel and device-mapper-multipath versions minor modifications might be required to match your specific needs. Those have been included as well in the listing below. getuid_callout	"/sbin/scsi_id -g -u -s /block/%n"
If you’re stuck with the EVA3000 personality right now, you might want to migrate to HSVX700. Please make sure you unpresent all LUNs via VSM before personality change to prevent unexpected DPM reboots. Note: You do not have to use HPDM Kit 4.4.1 for current distros This is only required for RHEL 5.3 and earlier due to an issue in the scsi_id tool used for getuid_callout. Need Data Protector 9.09 Free and OpenSource dependancies: I need to find the location in either the file system or the documentation that identifies the Free and Open Source components of the Data Protector product, as well as what copyright agreement (i.e.